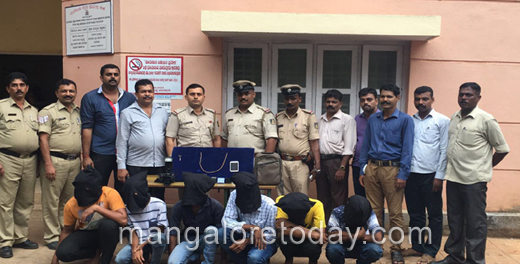 Mangaluru, June 9, 2016 : Pandeshwar Police have arrested six persons in connection with a case of looting a photographer based in the city of his valuables, two-wheeler and a camera. If the incident had taken place on the night of June 5, Sunday, the arrests were made on June 8, Wednesday. Those arrested are Sarfuddin (19) from Bunder, Mohammed Ramlan (20) from Faisalnagar, Shaikh Mohammed Dafan (19), Mohammed Arif Faizal (19) from Krishnapura, Salman (19) from Kallaup and Sayyad Nimar Hashmi (19) from Falnir. A camera worth Rs 70,000., scooter worth Rs 50,000, a cell phone costing Rs 12,000 and gold chain valued at around Rs 48,000 were seized from them. The six had targeted Gunaprasad (24) from Uppinangady who was a photographer at a studio in Kavoor when the latter was returning towards State Bank after visiting a temple. Six persons who had approached him seeking to know about some address took him towards the railway tracks at Goodshed where he was assaulted and robbed of his valuables including a gold chain, Rs 1500 cash, two ATM cards and cell phone. A complaint was lodged in this regard at Pandeshwar police station.